INDUSTRY.co.id - Jakarta - The Signing of PT Freeport Indonesia Divestment Agreement (PTFI) which took place on Thursday (12/7/2018), at the Office of the Ministry of Finance Jakarta became a momentum that marked the completion of the negotiation between the Government and PTFI related to the continuity of its operations in Indonesia. Present on the occasion are the Minister of Finance, Minister of Energy and Mineral Resources, Minister of Environment and Forestry, Minister of State-Owned Enterprises, President Director Inalum and PTFI. This signing is a strategic step of the Government to achieve ownership of majority of mining companies managing natural resources by Indonesian Participants in accordance with the mandate of the Minerals and Coal Act. According to information obtained from the official website of the Ministry of Energy and Mineral Resources, the Government has appointed PT Inalum (Persero) to execute the purchase of PTFI shares through the Special Corporation as the majority shareholder that will support the national strategic matters. The four main points of the negotiations have been thoroughly agreed upon and will become PTFI's development milestone forward. The four points are (a). Share divestment of 51% for the ownership of Indonesian participants, in accordance with the Contract of Work and Law No. 4 of 2009 on Mineral and Coal Mining (Minerba Law); (b) Construction of smelting facilities for 5 (five) years; (c). The stability of state revenue, pursuant to Article 169 in the Minerba Act, the transfer of PTFI's Working Contract to IUPK will provide an aggregate state revenue greater than state revenue through the Contract of Work; and (d) Extension of Production Operation 2 x 10 years, in accordance with the provisions of legislation. After PTFI has agreed on the above four points, PTFI will get a maximum extension of 2 x 10 years until 2041. Note that the Grasberg mine is the world's largest gold mine and the second largest copper mine in the world, with the potential for more mine management from 30 years. The added value of copper commodity can be improved through the development of copper smelter with a capacity of 2-2.6 million tons per year in the next five years. January 11, 2017 - Government Regulation no. 1 year 2017 related to the implementation of Minerba Mining Business Activities issued in order to uphold the sovereignty of the State over the management of natural resources. 10 February 2017 - ESDM Ministry issues IUPK Production Operations for PTFI and requests PTFI to comply with the terms of the extension in accordance with the provisions of the legislation. 20 February 2017 - Through a press conference at the Fairmont Hotel Jakarta, Freeport rejects IUPK, refuses the 51% divestment, and prepares for arbitration. 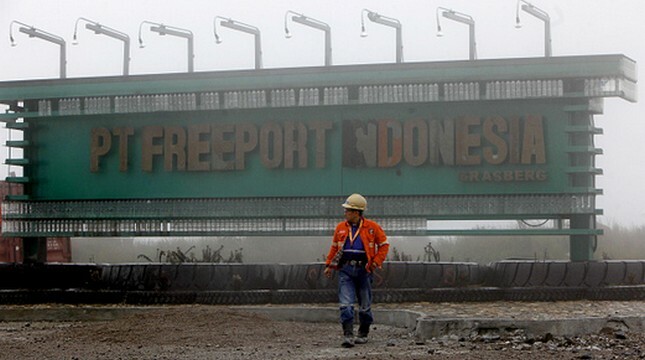 May 4, 2017 - The government opens talks with PT Freeport Indonesia regarding the 51% share divestment point, the smelter development, the stability of state revenue and the continuity of PTFI's operations in Indonesia. 29 August 2017 - PTFI approves 4 basic agreement points of negotiation; followed by a discussion of technical details related to divestment and investment certainty. July 12, 2018 - The Government and PTFI agree on all technical details of the negotiations as confirmed by the signing of the Principles of the PTFI Share Divestment Agreement. Talks Completed.